couldn’t believe it. Though my greatest passion is ministry to broken and hurting women, I had lived almost 10 years in Spokane before realizing there was a Women’s Crisis Shelter. I wasted no time in calling Diane, a friend that I learned was the director of the shelter. Diane welcomed my call and invited me to visit the shelter for a meeting and tour. We both had full calendars, so we scheduled a date several weeks away. As I knew the familiar voice of God’s Spirit, I made a trip to a local store that day to buy a silk rose. I wrote, “I’ve been waiting for you, Sandy. Love, Jesus” on the gold tag as He had directed. Curious about God’s assignment, I called Diane. “Do you have a resident by the name of Sandy?” I asked. “No, we don’t have a Sandy,” she said. “How about a Sandra?” I asked. “No. No Sandra either,” Diane answered. “Oh,” I said, a bit confused. Figuring I must have misunderstood God’s direction, I set the rose aside and thought no more about it. Diane called the day before our scheduled date. My eyes watered, glancing at the now dusty white rose that had sat on the counter for weeks. We confirmed our time for the next day, then Diane promised to introduce me to Sandy while I was at the shelter. “Oh, that’s right!” she said. Diane left me with one of the women for a few minutes, and then returned with a young woman. “This is Sandy,” Diane said. “The Lord wants you to have this, Sandy,” I said, holding the white rose out to her. She hesitated, blushed, and then received it, seemingly pleased yet unsure of what to say. When she saw the tag hanging from the rose, she read it . . . and then hung her head. I waited for her to look up, but Sandy kept her head down in silence. Her tears dripped onto the cement. “You don’t understand,” she said. I lifted her chin to look her in the eyes. She continued to weep, and I embraced her in silence. “I know,” she said, crying tears of joy. After hugs from many, I drove home, pondering God’s unfailing love. 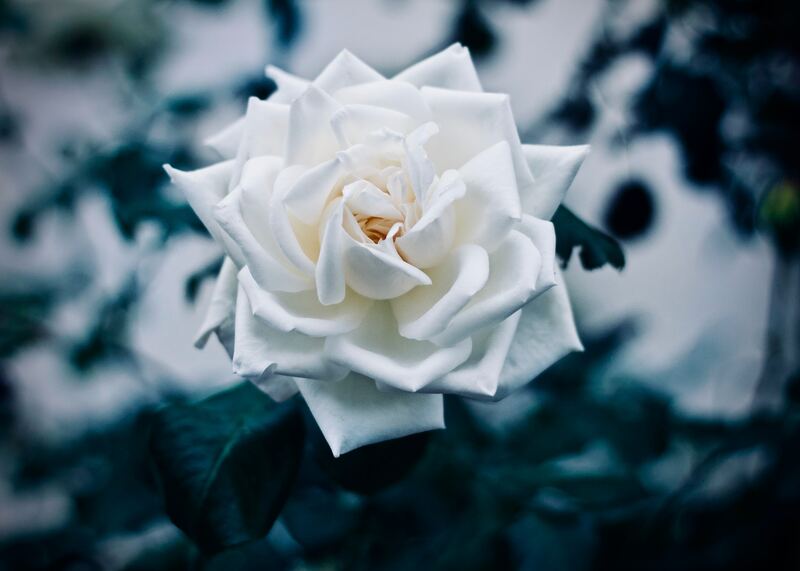 He had sent me to deliver a white rose—a symbol of purity and a new life—to remind His prodigal daughter that He had restored her purity and given her a new beginning.